Friday, November 24, 2017 by: Isabelle Z. (Natural News) We all know that fruits and vegetables are healthy, but are you eating enough of them? Even if you feel like you eat far more of these foods than most people you know, there is still a good chance that you’re failing to hit the recommended minimum. The CDC has just issued a report stating that less than one out of every ten Americans eat enough vegetables and fruits. Just how much are you supposed to be eating? According to CDC guidelines, you should be consuming at least three cups of vegetables and two pieces of fruit every day. The statistics paint a bleak picture of the nation’s health, with more than 290 million Americans failing to get the nutrients required to lower their risk of heart disease, cancer, obesity and diabetes. 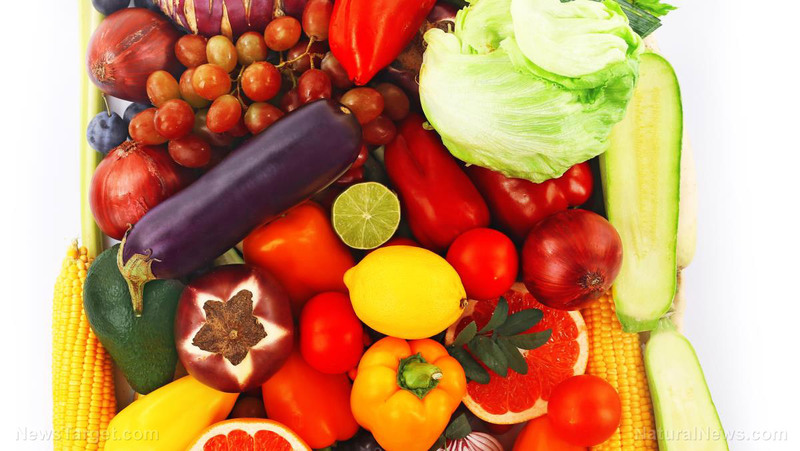 Experts say that eating a diet that is rich in vegetables and fruits can reduce the risks of many of the country’s top causes of death. Perhaps not surprisingly, Americans fare better when it comes to getting enough fruit than vegetables. Twelve percent of us are eating enough fruit, compared to just nine percent who eat enough vegetables. The study found that produce consumption was lower among young people, men, and adults living in poverty. In addition, the vegetable that is most commonly eaten – potatoes – is one of the least nutritious, especially when it’s consumed in the form of French fries. There are also some significant regional variations, with the rates especially low in Appalachia. The worst state when it comes to nutrition is West Virginia, where just seven percent of people meet the fruit minimum and six percent meet the vegetable minimum. Alaska topped the states in terms of vegetable consumption, with 12 percent of Alaskans eating at least three cups per day. Washington, D.C., meanwhile, topped the nation in terms of fruit consumption as 16 percent of people there eat at least two pieces of fruit each day. Even in those two places, however, more than 85 percent of people are simply not getting their minimum daily allowance. Public health experts point out that this poor diet is why America has significantly higher rates of premature death, obesity, heart disease and dementia than those nations that follow a Mediterranean diet, which tends to be rich not only in fruits and vegetables but also oily fish. If budget is a concern, there are still ways to eat more produce without breaking the bank. Sticking to fruits and vegetables that are in season – such as getting apples and broccoli in the fall – is one way to keep the grocery bill down. It’s also possible to find savings by comparing prices. Sometimes, you can get a special discount by purchasing fruits and vegetables in bulk. If you’re worried you won’t be able to eat them all before they go bad, you can chop up your vegetables, blanch them quickly in boiling water, leave to dry and then freeze them using heavy-duty freezer bags. This helps you save money while ensuring a steady supply of vitamin-rich vegetables. You can also freeze fruits, with frozen bananas particularly convenient to keep on hand for snacks and smoothies. You can also make and freeze entire recipes with vegetables you buy on sale. For example, consider doubling a vegetable soup recipe and freezing up some portions to eat for dinner in the future. This gives you something healthy to eat even when you’re pressed for time so you won’t be tempted to head for the drive-through. If you’re not a fan of sitting down before a plate of plain vegetables, you can also try incorporating them into recipes that you might not usually include them in, such as mincing some carrots or mushrooms and adding them to spaghetti sauce. In addition, the CDC has issued strategies that will help increase people’s access to produce, including the expansion of farm-to-institution programs at schools, workplaces, and hospitals.